INTRODUCTION: The purpose of this study is to review the laparoscopic management of Gastrointestinal Stromal Tumors (GISTS). Gastrointestinal stromal tumours are rare gastrointestinal cancers (0.1-3.0%). Complete resection of the tumour is the definitive management. In most institutions, traditional open resection of GISTs is the gold standard based on currently available evidence-based medicine. In several case series reports in Europe, United States and Asia, it has been well documented that GISTs can be managed laparoscopically. There has only been one small published Canadian experience of laparoscopic management of these tumours. 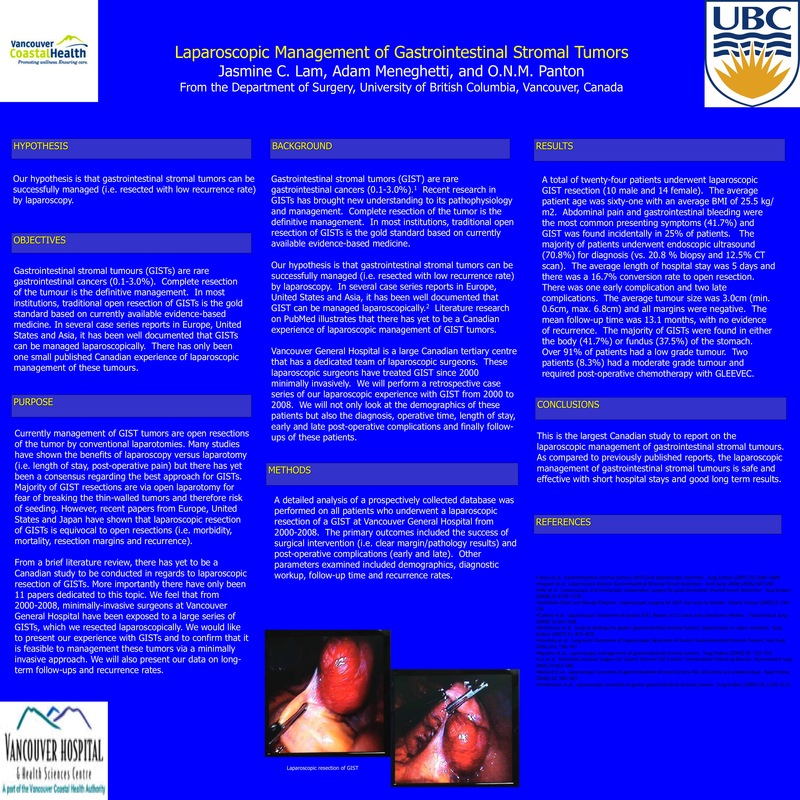 METHODS AND PROCEDURES: A detailed analysis of a prospectively collected database was performed on all patients who underwent a laparoscopic resection of a GIST at Vancouver General Hospital from 2000-2008. The primary outcomes included the success of surgical intervention (i.e. clear margin/pathology results) and post-operative complications (early and late). Other parameters examined included demographics, diagnostic workup, follow-up time and recurrence rates. RESULTS: A total of twenty-four patients underwent laparoscopic GIST resection (10 male and 14 female). The average patient age was sixty-one with an average BMI of 25.5 kg/m2. Abdominal pain and gastrointestinal bleeding were the most common presenting symptoms (41.7%) and GIST was found incidentally in 25% of patients. The majority of patients underwent endoscopic ultrasound (70.8%) for diagnosis (vs. 20.8 % biopsy and 12.5% CT scan). The average length of hospital stay was 5 days and there was a 16.7% conversion rate to open resection. There was one early complication and two late complications. The average tumour size was 3.0cm (min. 0.6cm, max. 6.8cm) and all margins were negative. The mean follow-up time was 13.1 months, with no evidence of recurrence. The majority of GISTs were found in either the body (41.7%) or fundus (37.5%) of the stomach. Over 91% of patients had a low grade tumour. Two patients (8.3%) had a moderate grade tumour and required post-operative chemotherapy with GLEEVEC. CONCLUSIONS: This is the largest Canadian study to report on the laparoscopic management of gastrointestinal stromal tumours. As compared to previously published reports, the laparoscopic management of gastrointestinal stromal tumours is safe and effective with short hospital stays and good long term results.